As I sit in my office here in Brno, I can see the twin landmarks of this small city situated in Moravia, the southern part of the Czech Republic. The first is Brno Castle sitting atop a natural hill and the second sitting on top of another nearby hill is the Church of St. Peter and St. Paul. Brno sprawls across a valley and is surrounded by higher elevations. It is a beautiful city that is full of opulent early 1900’s architecture that speaks to the golden era of the Czech Republic. Back then, wealthy merchants tried to outdo each other in building their new homes leaving us with a legacy of solid buildings that have now been converted in apartments and offices. It is like a mini-Prague in many ways. Brno is a city of secret places. At least that is how I like to think of it. It is full of below ground cellars and tunnels that often house bars, clubs and restaurants. Some of them are not so easy to find either meaning that I am constantly discovering new places – treasures. Brno and the Czech Republic have a pagan heart. Czech culture is full of tradition, myth and legend that echo back to pre-Christian times. At Easter, gangs of boys and men roam the villages and streets carrying specially made whips to beat the women with around the knees. A little song is sung as they do so and the woman gifts the men with something nice – a chocolate egg or sweets. It is of course, a fertility rite with its origins long lost in the mists of time. On St. Nicholas’ Day, children are accosted by A Devil, St. Nicholas and an Angel. They must perform a little song or dance for these characters and then they will either receive a gift if they have been good or be carried off in the Devil’s sack if they have been bad. As you travel around the country, you notice little roadside shrines often holding a miniature Saint figure and the remnants of candles. These are nothing more than Christianized pagan shrines set up to assist the recently dead find their way. The land is full of strange places too. There are Castles everywhere with haunted forests surrounding them. It is a land of mystery and myth. The gates to hell are to be found north of Prague where a huge hole in the sandstone was said to allow demons to escape and scare the locals and passersby. The solution was to build a Chapel over the hole dedicated to St. Michael and then a Castle around the Chapel. No ordinary Castle this though as it is designed to keep something in as opposed to keep people out. As for ghost stories? Every town and village has stories of unhappy spirits, tragedy and tyranny. The undead are also feared in this part of central Europe and tales of vampires can be found in many locations. Prague is particularly haunted but then, most of the rest of the country is and that’s why I often think of the Czech Republic as the most haunted country in the world. Read about the Devil’s Bible, a chapel of bones and a vampire in Gary’s latest article here. A new book, now available on Amazon! The Czech Republic is a beautiful, landlocked country at the heart of Europe. It has a pagan Slavic past that has survived and indeed even been adopted by Christianity. It is a country where each town and city has its own ghost stories, legends and myths, where innumerable castles dot the landscape, each with their hidden treasures, specters and wraiths, separated by haunted and magical forests. 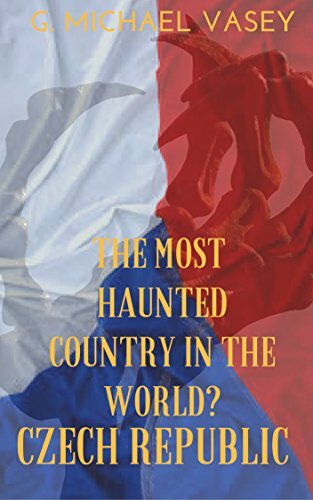 The Czech Republic may just be the most haunted country on the planet! Discover the creepy ghosts of Prague, the location of the mysterious gate to Hell, creepy haunted forests, tales of vampires and the undead, abandoned cemeteries now used for satanic rituals in the dead of night, strange and mysterious imps and elves, and much more. The Czech Republic is a country of ghosts and myths, haunted and mysterious places and strange pagan customs. If you plan to visit the Czech Republic – here is your guide to the supernatural side of the country! Discover the ghosts and haunted places of the Czech Republic. This entry was posted in Ancient sites, Books and tagged Brno, czech republic, folklore, Gary Vasey, gates of hell, ghost stories, magic, mystery, supernatural. Bookmark the permalink. I’d rather like to see it too. Loved this post! As a resident of Prague in 1970s, my hubs and I were introduced to vampires (vahmpeers) and spent a night at a monastery in the middle of nowhere, shaking in our boots!